It's that time of year wherein artists unleash festive freebies, ghoulish get-downs, and Horror-filled haunts. Yes, we're talking about seasonally-appropriate Halloween-themed/centric releases! San Francisco producers, Bay Area beatsmiths, and Gurp City affiliates G-Pek & Brycon returned with the fourth installment of their annual Halloween beat tape, There's No More Room In Hell Part 4; this time, recruiting like-minded producer buddies DJ Eons One AKA Dan Lactose, Yelir, and B.I. Lectric for their ghoulishly good time. Studio Don, a mysterious entity, somehow affiliated with the series, explains: "for the last 4 years, Gurp City producers G-Pek & Brycon have been assembling a nightmare soundtrack for Halloween revelry and inviting one more beat-maker homie to join in every year. This year, the legendary B.I. Lectric AKA Big Shawn of Bored Stiff joins the roster, along with Eons One & Yelir." G-Pek & Brycon Present: "THERE's NO MORE ROOM IN HELL" (Volume 1) from 2015 featured one single track clocking in at just under 20 minutes created simultaneously by the two top-billing producers. Although, for 2016's There's No More Room In Hell II, Brycon & G-Pek recruited Dan Lactose, featured here under his oft-used DJ Eons One alias, to join in for their festive frolic. Last year's There's No More Room In Hell Part 3 featured San Francisco studio rat Yelir, as does Part 4. Studio Don ominously adds, "this gruesome medley was designed for repeated listens, seances, and zombie slayings. Simultaneously, as our cruel world becomes more Hellish, these sounds paint a dripping and haunted portrait of the Hell on Earth we all should be preparing for..." There's No More Room In Hell Part 4 clocks in at just under 30 minutes and features one brooding track from each Brycon, B.I. Lectric, Yelir (or "Hellir,") Eons One, and G-PEK. 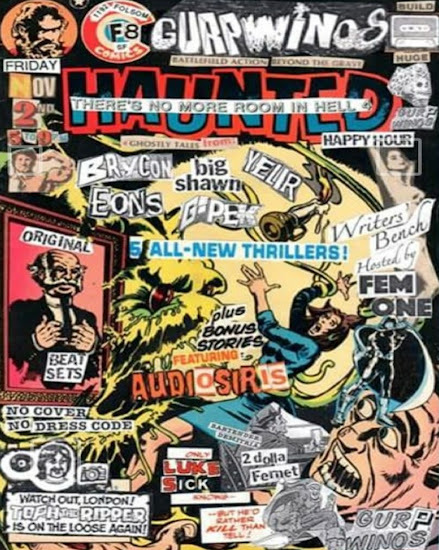 Frightfully self-described by @bryconmusic as "Crate Goblins, Gurp Goons, and Funky Zombies," each participating producers' submission appears to be a spook-tacular multi-part medley. There's No More Room In Hell Part 4 is currently available to stream, downlaod, or purchase from Brycon's Bandcamp page.